This past week was probably the craziest one yet this semester. The generally relaxed pace of most of my classes had lulled me into not keeping up with the syllabi, and I found out Monday evening as I was heading out for tacos with some friends who I usually go out with after newspaper production that we had a paper due in History and Nature of the English Language the next day. This wouldn't have been horrible if it weren't for the fact that I had just committed in newspaper production to doing a relatively long video for Triangle about SGA elections that were happening that same night. So essentially, in that moment it went from being a late night to no night at all. Possibly the craziest thing about the week though, was how it ended: salsa dancing. Yes, you read that right. 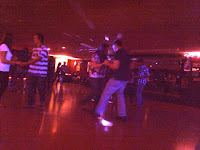 Salsa dancing. After standing at the table for Triangle at the organizational fair for presidential scholarship day, I decided to stay on campus to eat. I ended up sitting with my friend Meagan and some of her friends, who told me they were going salsa dancing in Cleveland with some other people and that I was invited if I wanted to come. I'm really a terrible dancer, and have never done any kind of Latin dance, let alone salsa before. However, I think I felt that I had been stuck in the same old pattern of not doing anything interesting or original for the last couple weeks and said yes anyways. So around seven, I got into one of three cars full of students who were all going to this "dance studio" in Cleveland Tennessee that no one seemed to know anything about. When google maps led us through a railroad yard surrounded by warehouses and car garages to a one story building ringed with Christmas lights and a sign that said "Luv 2 Dance," I think at least a few people in my car were wondering what they had gotten themselves into. Despite the slightly questionable location and appearance, it ended up being a great place though. It's owned by an Hispanic family from the area and hosts all kinds of dance events ranging from salsa to ballroom. They had a dance instructor, which was good. As I said before, I had no idea how to do salsa, and that went for probably a little over half the people in our group to. 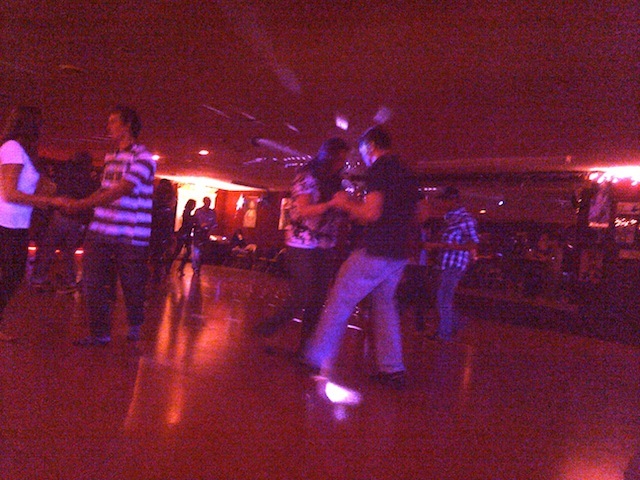 So after a half hour lesson or so, they turned down the lights, fired up the disco ball, and everybody danced until about midnight. One thing that made it interesting was that it was a pretty random group of people. Actually, it seems like whenever I do something like this it's a random group of people who don't normally do things together. But then, judging by the frequency at which I do things with people, just the fact that I'm there probably makes it a random group of people automatically. But I guess I'm okay with that. Do you think you could bring up all of the parts/games for the Xbox when you come up? it's been overheating and crashing lately so it needs the Intercooler fan. Yes, planning on bringing them.